I’m an XP fanboy. Even if the XP community is manifesting paranoid schizophrenic at this point (more on this in a future post), once you have experienced pairing and have a break through where things start to flow, you can never go back. Everyone working in isolation becomes really painful and is frankly less efficient IMHO, especially over the life of a project. So how can a distributed team work together? I’d been reflecting on a development tool called UNA, one of my personal highlights from Agile 2008, when I saw the Devunity presentation from TechCrunch 50 which set out to provide a similar environment. These types of tools facilitate possibilities for working together that I will try to illuminate, and then I’ll throw in my 2 cents plus interest. John is obviously intelligent and intense, which means I automatically like him. Marketing admittedly might not be his strong point (I do appreciate the Gigeresque imagery, though I’m not sure the proverbial ‘everyone else’ can. ), but he’s put a lot of time and thought into building software and how people can do it better. Una is the result and when you see John talk about Una, this is obviously a labor of love. Ok, so what does Una enable? I’m not totally sure, but I know that watching John use it and what I learned using Una for two hours was compelling enough that I’m still thinking about the experience six weeks later. Una is for all intents a text editor bordering on IDE with a networking component that lets multiple people work on the same files at the same time. I have my cursor, you have yours and when the network packets are flowing, we can see each others work in real time. This is different from sharing a screen, because we can all control what we see and do independently. Whenever anyone saves a file UNA runs the tests and everyone knows how long ago the tests were run because there is a timer which resets after each run. And this was only after an hour of working with a tool I’d never seen before and a person I’d never met! Imagine what might happen after working this way all the time with a talented team… Honestly, I’m not really sure, but based on what I saw from the TC50 presentation Devunity also sees some of the same potential. This is where my two cents starts, but first I need to introduce a few more ideas (I did promise ‘meandering’). I really really really like data, and I especially like figuring out interesting ways to take lots of data from different places and present it in a way that facilitates understanding. At some point in the past, I also enjoyed playing multi-player real time strategy games. 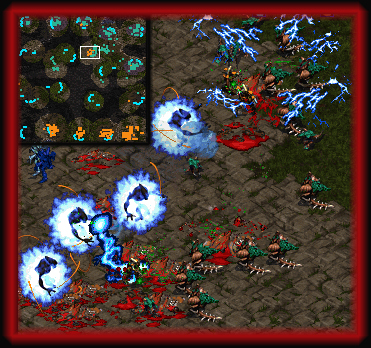 My favorite games enable epic battles with all manner of complexity in the viable strategies (ok, and an occasional zerg rush). A critical skill one develops playing these types of games is keeping an eye on the mini map. Players develop an intuitive notion of critical places on the map. Just one pixel of certain colors anywhere might warrant investigation, but flashes of color in certain places require immediate attention or the game is lost. The mini-map also let’s you know what your allies are doing, where they might be winning or losing, and is critical for any sophisticated coordination. In parallel, people have put a lot of energy into tools that let you analyze the quality of code, particularly Object Oriented code. Now what if we can update this mini-map data in real time and use it as feedback in an environment like UNA? The team will start to intuitively know ‘what’ colors ‘where’ warrant investigation, or perhaps even immediate action. The battle unfolds transparently and with a clear sense of where the team might be winning or losing. While we’re at it, let’s put VOIP channels in this thing and facilitate/record dialog, too. I can’t think of a single human endeavor that doesn’t benefit from observation, analysis and reflection. The code review process would go from looking at the static result to watching the journey. Root cause analysis potentially reveals more about ‘how’ and ‘why’, instead of just groping at ‘what’. What could this feedback reveal about how we work, and how we work together? As I stated in the beginning, I don’t know… but it sounds pretty cool, no? I not sure where the line is between enabling productivity and gratuitous indulgence, but the technology is all there, it’s just a matter of hooking the right things together in interesting ways. This entry was posted on Sunday, September 28th, 2008 at 12:32 am	and tagged with Agile 2008, Collaboration, Devunity, Pair Programming, Techcrunch 50, Una and posted in Agile. You can follow any responses to this entry through the RSS 2.0 feed. There are other projects that give you bits and pieces, like the NetBeans Collaboration Project and the Eclipse Communication Framework. From what I’ve seen so far, these mostly feel like add ons, but do lay some ground work for integrating distributed features. As I said before, the pieces for doing this are all there, just waiting to be assembled. Does anynone know what Una uses to represent, channel this back and forth? is it open source? Managing an extremely distributed dev team doing XP and TDD, these sort of tools are in dire need!